According to the USTA, tennis is a growing sport in America with more than 30 million players. 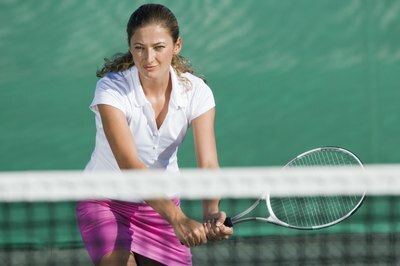 Playing tennis is a great way to burn off those extra calories and still have fun in the sun, but torn ligaments and sprained ankles scare some women away. By taking a few precautions, you and your tennis partners can reap the health benefits of playing tennis and safely enjoy this international sport. Warming up and stretching before playing tennis prevent the most common athletic injuries, such as sprained ankles, pulled muscles and torn ligaments. Warming up and stretching also help prevent arthritis, enhance athletic performance and are better for your cardiovascular system. Warm up first by briskly walking or jogging slowly, which raises the body temperature and gets the blood flowing. After the muscles are warmed, stretch the major muscles of the legs, arms and back. Without stretching your muscles, your are more likely to experience muscle pain and injury. The tennis court should be checked for safety. Tennis balls and gear should be off the court, and it should be free from dirt and grass. The court should be flat and have no holes or cracks. Players should never play on wet, slippery courts or during adverse weather conditions. When playing at night, the court should be well lit. Wearing the proper clothing for outdoor activity is imperative. Clothes should be lightweight and loose fitting to avoid overheating, but they should never be baggy enough to cause tripping. Darker clothes should be avoided because they retain heat, while lighter colored clothes help to prevent a heat stroke. Sunlight can hinder vision, making injuries more likely; wearing sunglasses, hats and sunscreen help protect against the sun's harmful rays. Tennis rackets come in all shapes and sizes. Players should use a racket of appropriate weight to avoid shoulder, wrist and elbow injuries. The tension of racket strings vary, and having a racket with the right tension is important, too. Talk to a distributor or tennis instructor to determine which racket is best for your game. Knowing how to swing the racket and move your feet can prevent common injuries such as "tennis elbow." Tennis elbow is a repetitive-stress injury that results from swinging improperly. The proper way to stroke a tennis ball with a racket varies and is dependent on a number of factors, including speed, angle and height of the ball. 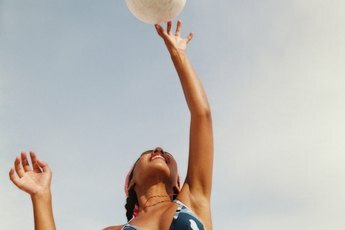 Beginners should consider taking lessons from an instructor who knows the best techniques to prevent injury. Why Is Badminton a Good Game to Help Maintain & Improve Physical Fitness?